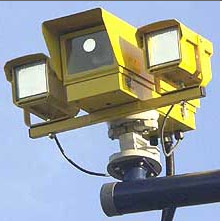 I am a conservative and I must say, I – like many other like minded folk – have no problem with speed cameras. I WOULD take issue with a camera watching my house, as I feel it is not anyone’s business who comes and goes into my home nor is it anyone’s business to know my families habits and routines. That is just opening the door to trouble. But no, no problem at all with my local government enforcing laws. OVERSTEPPING laws and attempting to take from me, my rights granted me by the Constitution… yeah, I have trouble with that. I, like the majority of conservatives are law abiding individuals. That is not to say I have not ever gotten a speeding ticket. Of course I have in the 26 years I have been driving. And NEVER have I balked at the idea of accepting the consequences.